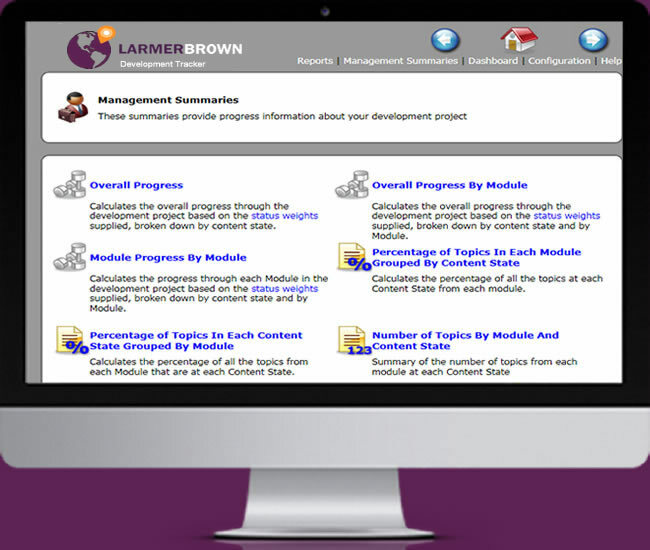 Larmer Brown´s Development Tracker provides real time reporting by continually interrogating the content database. Data is output to a desktop portal providing members of the Project Team with development statistics via a series of customisable graphs or tables. The Development Tracker identifies the development phases and deliverables and, utilising an integrated weightings matrix, provides detailed customisable reports indicating progress against pre-assigned objectives via an array of percentage complete reports. The development methodology being adhered to by the Developers can be aligned to user profiles. The Development Tracker uses this tracked data to provide status by Developer, Subject Matter Expert, Editor or Auditor. Additional Reports detail status by Module, Role or Topic across the various content states. The Development Tracker quickly and unobtrusively identifies bottlenecks and/or content shortfalls within the development program ensuring risk can be identified with sufficient notice to take remedial action. We introduce the Development Tracker to all Larmer Brown Development Projects using either the Larmer Brown Platform or Oracle User Productivity Kit (UPK) and the tool is also available under Licence. For a Content Development Team the need to meet both deadlines and budgets is a precarious balancing act. With different areas of the Project dependent on the Content being produced by the Development Team, the importance of meeting numerous deadlines throughout each phase of a Development Project cannot be underestimated.